You've come to the right place for Windsor furniture! 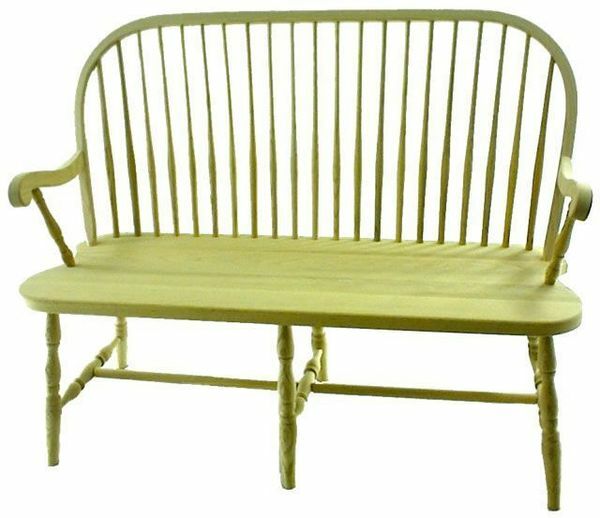 The Amish Round Spindle Windsor Bench offers up Windsor comfort with a beautiful bench seat for entryway, bedroom, living room or hallway. Our Amish woodworkers pay close attention to every spindle they create to add support to this Windsor bench. Your new Windsor bench is just a few clicks away. Choose options online or connect with an Amish Furniture Specialist for assistance. We can't wait for you to see your new Amish furniture. Thanks for shopping with DutchCrafters. Seat Width: 36", 48" or 60"
I really love the Amish bench and dining chairs! Thanks for all your help with customizing the furniture! Two pictures of your benches at the Cosmopolitan Hotel are attached. We still haven't opened yet, so the settings will change in the near future, but these pictures should give you some idea of their home. Also, as you know, pictures rarely do justice to reality--they look much better in real life. When i first saw them i was struck by how much i enjoyed them instead of chairs at the dinning tables. We received the benches a few days ago and wanted to thank you. They are beautiful, and the workmanship fantastic. I really appreciate your help, and you did a great job.